For our Brethren here at Home ..
was free to do so. Have You Signed Up For Federation's 20th Anniversary Mission Yet? ed, "The Sounds of Silence." of Gestapo's Bureau in France. and the adult Midrasha series. which touches all walks of life. and our brethren in Israel. that helps our people in need. and the Jewish Family Service of North Broward, 8358 W.
reaffirmed to the peoples of the world. centuries after the Exodus from Egypt. willing to make sacrifices to keep it. to reassert their destiny to be free. ening of spring.the rekindling of life. It' at makes us Jews. WEST PALM BEACH: 4714 Okeechobee Blvd. Sponsoring the GUARDIAN PLAN insurance funded prearranged funeral program. fare that 52 percent of the funds were being sent to Israel. satisfaction as the announcement meant to impact. participated in the budget deliberation of the JCC. over $7 million will be collected by the Federation. devoting a far greater portion of our resources. few countries in the world willing and able to do so. their mutual interests and concerns. suggests that these are rectified quickly. series, will be under way. entered the ghetto, 2,100 soldiers, including SS troops. howitzers and other artillery pieces, and 1,358 rifles. some 20 men and women, young. And what was our arms? soldiers had been killed and a number wounded. spite of everything have to fight for access to each house. body dangled lifeless from railing." suicide. Others were killed, but a few managed to escape. ing blown up or by perishing in the flames." Adolph Hitler would take his own life in a bunker in Berlin. of the Atlanta, GA Federation. $40 million. Because the U.S.
Not since the asking of the Four Questions has something so tiny made it so big. it's Tettey's tiny little tea leaves. They've been making it big in Jewish homes tor years. Tetley knows that just as tiny lamb chops and tiny peas are the most flavorful, the same thing is true tor tea leaves. So tor rich, refreshing flavor, take time out for Tetley tea Because tiny is tastier! The time, to respond is now! than one is asked to consider. speakers in the Jewish World. to the Israel Foreign Ministry. Water. You'll be tasting water for the very first time. the holiday and its season. president of the Jewish Family Service ofBroward County. in this most important activity. visits to Israel in 1987. H'n who brings single people on "Cagney and Lacey." This wine has not been boiled. new rental plan, without endowment or entrance fee. will be offered for a limited time only. of the Judaica High School. A lawyer can be gross. But a numsh is something else. He just can't be outdone. Than being close to G-d.
right, SEFTY Youth director for Temple Beth Orr. SERVING. IS 98 PC FRT FREE RN0 IS LOU IN S00IUPI. mi in** Va iVyrj n *vn nwjTon-n*"
13 of* 'i|T* nr^jrVi mur^ I*"1** **s T"
As wr i*m-rir Ita/rtlu^al of fnnkmt. Traditional Seders by a Renowned Cantor! Franne Alter, Susen Grossman and Dr. Haim Shaked. will run from July 1 to 23.
werp, and a visit to Bruges. fices to Miami in November. ly recognize some of them. enough gold to make a statue? states that he turned to G-d.
call and are very nice. one who has passed away." actly what is needed most. tant to Arthur," Felice stated. educate women in Kfar Saba. Renewal chair is Alvera A. REACH OUT AND FIND SOMEONE THROUGH. .
slaves to Pharaoh in Egypt,"
in their struggle for freedom. the means to "make Pesach." Each trip to Israel is unique. intended to ease the pressure. Israel and others like myself. for it didn't rain on our parade. erass and trees bright green. to Israel originally from Libya. the entire 350 year history. as high as 60 percent." "We are losing the battle,"
volunteers feel right at home. Messing, Pearl Miller, Samuel K.
Haskell, Hy Kaplan, Marcus A.
Ruth Abels, David Abels, Rose V.
Julius Wind, C. Rubinstein, K.
"Six million and counting .."
In a special interview with the Floridian, Sheldon S.
funds for all of our brethren in need." goal for '87 in reach. ticipatwn from the Margate community. from the hours of 9-11 a.m.
ed with a light supper. muda Club/UJA chairman Bernard Simms, right. Mr. and Mrs. Sandy Brown, Stuart Reich and Richard Raphael, dent Brian J. Sherr. After all, tonight can be to give today. tee meeting. 10 a.m.-noon. At Federation. plete with black bow tie. with those of the 80's. Miniature Nuts, 8 oz 8.95; Seder Mints, 8 oz.. 6.95; Almond Kisses. 8 oz 5.95. The Galleria, Coral Spuare. West Palm Beach only. ner. 7:45 p.m Family Shabbat. and 4:30 p.m. Children's show. No. 1309: 9:30 a.m. Meetine. which people feel under stress. 1-3 p.m. Meeting of the Board. tian Pharaoh to let them go. extend best wishes to you and your family. May your Passover season be filled with happiness. porters Sol Schulman and Leo Goodman. Perlman Campus at 6501 W.
David Posnack Hebrew Day School. established a Memorial Fund in honor of her late husband Alvin. forward to Israelsymbol of the Jewish spirit reborn. i ne attune people Deneve m.
COME TO ISRAEL COME STAY WITH FRIENDS. Passover 4 Time To Create Miracles . One People Sharing One Destiny. has been our most constant value. us, Soviet Jews have a prayer of freedom. munity is stronger than ever. realize a modern vision of compassion. programs helping so many of our people. "If we don't, who will? countless hours of dedicated service. "Fed the personi touch cfprvfasionabuxlhXyaBsofexperience." nothing's better than Mott's* Apple Sauce and Apple Juice. be sure to stock up on Motts." Best wishes to you and your family during Passover. grams listed please call the center. dish all through the years. who are 55 years old or more. returned to JCC by April 27. White and the Seven Dwarfs,"
And It Means So Much. ALREADY IN TOUCH WITH THE FUTURE? the benefits of our experience. physician, we'll help you find one. nothing less than expert cardiac care. Our doctors make the difference. ple Beth Orr, Coral Springs. on April 4 at Kol Ami. on Channel 2 starting at 8 p.m.
25th BIRTHDAY GALA. We will be partying from 6 p.m.
mation, please call Laurie B. Workman, MSW at 966-0956.
day 8 p.m.. Saturday 9 a.m., 5 p.m. Rabbi Avaron Draiin. Cantor Irvin Bell. TAMARAC JEWISH CENTER (721-7660), 9101 NW 57th St., Tamarac, 33321.
day 8:45 a.m. Rabbi Kurt F. Stone. daily 8 a.m.; Sabbath 8 p.m., Sabbath morning 8:45 a.m. Rabbi Avraham Kapnek. Monday through Friday 8:30 a.m., 5 p.m. Friday late service 8 p.m.; Saturday 9 a.m..
TEMPLE BETH ISRAEL (742-4040), 7100 W. Oakland Park Blvd., Sunrise, 33313. Saturday 8:45 a.m., 7:45 p.m. Rabbi Howard A. Addiaon. Cantor Maurice A. Neu. Blvd., Deerfield Beach, 33441. Service*: Sunday through Friday 8:30 a.m., 5 p.m.
Joseph Languer. Cantor Shabtal Ackerman. TEMPLE B'NAI MOSHE (942-5380), 1434 SE 3rd St., Pompano Beach, 33060. Service*: Friday 8 p.m. Cantor Jehudah Heilbraun. TEMPLE SHA'ARAY TZEDEK 741-0295). 4099 Pine Island Rd.. Sunrise, 33321. Friday at 5 p.m., Saturday at 8 a.m. Charles B. Fyier. President. 8 a.m.. 5:30 p.m., Saturday 8:45 a.m., 5:30 p.m.
a.m., 5:30 p.m. Study groups: Men, Sundays following service*: Women. Tuesday* 8 p.m. Rabbi Aron Lieberman. Saturday 8:45 a.m. and sundown. Joseph M. Reiner, President. Stirling Rd.. Fort Lauderdale. 33312. Services: Monday through Friday 7:30 a.m.
M Ckeis. SehMMw. Ceagregati.. praaMo* Hsmsa. FWascWr. I?!FL,.S!? ""**** <47,-**>. 8 W. Oakland Park Blvd., Sunriae, 38881.
vices: Friday 8 p.m.; Saturday 10 a.m. RabM Mark W. Grose. Bat Mitzvah. Rabbi Jeffrey Ballon. Cantor Rita Snore. Creek Parkway. Rabbi Bruce S. Warahal. Canter Barbara Roberta. 1- How is meat koshered? are served on the Sabbath? values that concern our Torah? 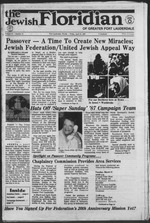 In 1987, Passover begins April 14. Passover is history's first freedom festival. It is also an opportunity to welcome the advent of Spring. who respond to the divine message about human equality. first night (by some Reform). servitude and the joy of deliverance. originated communion or the Eucharist. 12:3; Leviticus 23.4; Number 9, and Deuteronomy 16.
to Menorah where your lasl choice is your best choice. At Passover, your Seder table is blessed with prayers. Family. From all of us at Manischewitz, a happy, zissen Pesach.